THE obstetrician walked into the room, and told Rachelle Martin that her baby was dead. That was just the beginning of her nightmare. It was 1996 when she had to give birth to her already-dead son, and the memory of that time still haunts her. At about 37 weeks Mrs Martin was worried about her quiet baby. 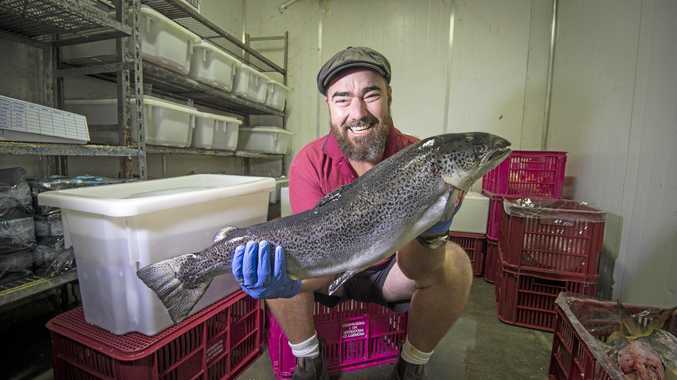 Her obstetrician at Glenelg Community Hospital reassured her, saying everything was "tracking quite well". Later, things started to go badly wrong. Bleeding, she went back to the hospital. "There was no movement and no heartbeat but we weren't to know this for at least half an hour until the covering obstetrician arrived," she said. "When he eventually arrived, he stood in the doorway and announced to the room that my baby was dead". "The shock of the manner in which he delivered this information will stay with me for the rest of my life." She had to deliver the baby, and she remembers lying there, wanting to die. During the devastating delivery the obstetrician told her she would probably "die on the table" and should get her affairs in order. She was left without supervision, her dead son in a crib beside her. Eventually a courier took him away in a cardboard box. This year, the hospital responded, saying the staff involved were no longer there - indeed they haven't had maternity patients since 1998. But chief executive officer Deborah Muldoon, who has only been in the role for three months, apologised for the hospital's lack of care and support and said she "cannot even begin to appreciate what she went through". "Of the staff that still work here, several still remember Mrs Martin, and although maybe no consolation to Mrs Martin, they spoke about the devastation all the staff felt when her baby didn't survive," she wrote. Belinda Sloane’s post on Instagram for International Pregnancy and Infant Loss Remembrance Day. Fast forward to today, and while the brutal treatment of Mrs Martin is hopefully a thing of the past, stillbirths are just as common as they were then, despite all our medical advances. 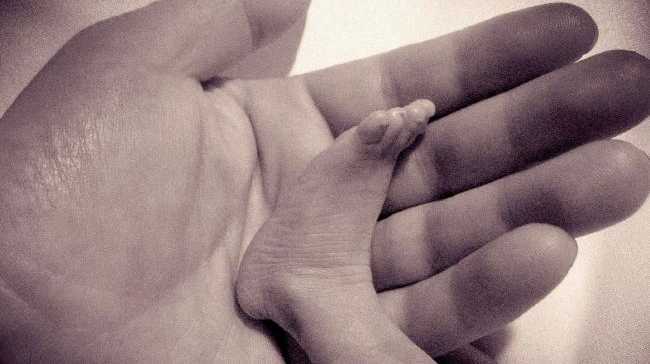 A stillbirth is a death after 20 weeks. An earlier death is a miscarriage - while there's a legal distinction, it's not so set in stone for women who lose a wanted pregnancy. Miscarriages are more common; with early miscarriages a woman might not even know that she's pregnant. That could mean the rate of death is as high as one in four. While there are symptoms to look out for - cramps, bleeding, or a lack of movement - there are still no known causes for many foetal deaths. Meanwhile, the federal Parliament, alarmed by the rate of stillbirths, has begun an inquiry into the issue. As the inquiry gets set to report next year, change has already happened in the community as more families share their own losses from stillbirth or miscarriage. The silence has lifted. And many of the submissions into the inquiry say this is one of the best things to help prevent foetal deaths. For too long, women have blindly trusted doctors who effectively tell them to have a Bex and a lie down. As more become aware of how common infant loss is, they're more likely to push for answers or help if they feel something is not quite right. Celebrities have been instrumental in raising awareness. Belinda Sloane, a television presenter, and her husband, AFL star Rory Sloane, opened up in August about the death of their son Leo. "Last week we said goodbye to our beautiful little man," they wrote. 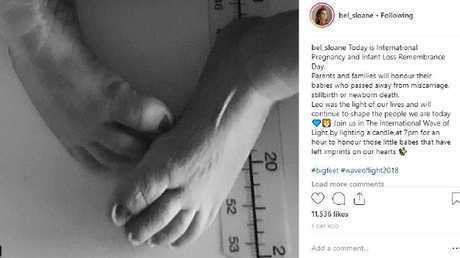 This week Adelaide actor Teresa Palmer shared her heartbreak at losing her baby at seven weeks in 2015. 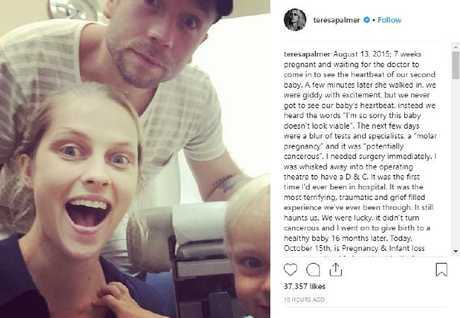 Teresa Palmer’s post on Instagram for International Pregnancy and Infant Loss Awareness Day. Picture: Instagram. She chose October 15, Pregnancy and Infant Loss Awareness Remembrance Day to commemorate it. And model Megan Gale also chose Monday to talk about her loss. "I'd gone for a regular check up with my obstetrician who regretfully told me that the baby I was carrying was no longer alive. Needless to say the heartbreak and sorrow surrounding the loss was immeasurable," she said. Charity Still Aware has told the inquiry that a mother's instinct is critical. "This is too often ignored," they write, adding that expectant mothers need to feel they are being listened to. More research is also necessary, and that research has to be translated into useful tools. Still Aware would also like to see a national campaign about stillbirths, and they point out that indigenous and multicultural families need tailored advice. The University of Adelaide has found that stillbirth has "a substantial psychological impact on women, their partners, and the extended family unit, with ongoing health and wellbeing effects which can last for months, years or even decades". Researchers have written to the Senate inquiry that warning signs are "not routinely discussed" in peri-natal classes or at the doctor's clinic, and many parents have no idea how common it is until it happens to them. Doctors also fail to recognise their loss as the loss of a baby, they write. They add that fathers need to be included, along with other family members. Men struggle to return to work and work effectively; they haven't had time to process their loss. And they don't have access to proper paid leave. While some fathers feel supported, others do not. "A commonly expressed desire was to be approached individually, or by a male support worker, who could engage with fathers and spend time providing information and answering questions." They also want proper guidelines for parental leave, so mothers and fathers have time to grieve properly. And, as the outpouring of emotion showed this week, pregnancy loss is a true cause for devastating grief. "We never held our son again," Mrs Martin wrote. "I recall my milk coming in late one night at the sound of hearing other newborns crying."